CLARIFY-2017 will perform measurements over the the SE Atlantic to improve the representation of BBA and clouds in forecast models on a range of spatial and temporal scales, increase the fidelity of aerosol-radiation and aerosol-cloud interaction processes and cloud representation, and their impacts on local, regional and global weather and climate. The following sections describe the project’s Key Objectives, the Enabling Objectives and how these tie in with the Work Packages (WPs). KO1: Measure and understand the physical, chemical and optical properties of biomass burning aerosol (BBA) over the SE Atlantic (WP2). KO2: Measure and understand the physical properties of SE Atlantic stratocumulus clouds and their environment. Improve the representation of these clouds in a range of models (WP2, 4, 5). KO3: Evaluate and improve the representation of BBA-radiation interactions over the SE Atlantic when clouds are absent/present at a range of model scales and resolutions (WP2, 3, 5). KO4: Evaluate and improve the representation of BBA-cloud interactions over the SE Atlantic at a range of model scales and resolutions (WP2, 4, 5). EO1: Use forecast products and observations to optimise scheduling of the flight plans (WP1). EO2: Characterise chemical, microphysical, optical and radiative properties of BBA over the SE Atlantic, focusing on black and organic carbon, light absorption and single scattering albedo (WP2, WP4). EO3: Investigate the geographic and vertical profile of BBA over the region (WP2, WP3, WP4). EO4: Characterise the vertical thermodynamic structure of the marine boundary layer, residual continental polluted layer, free troposphere, and diurnal and synoptic scale variations (WP2, WP4). EO5: Characterise the spectral reflectance of the ocean surface and stratocumulus clouds when overlying BBA is present/absent from the atmospheric column (WP2, WP3). 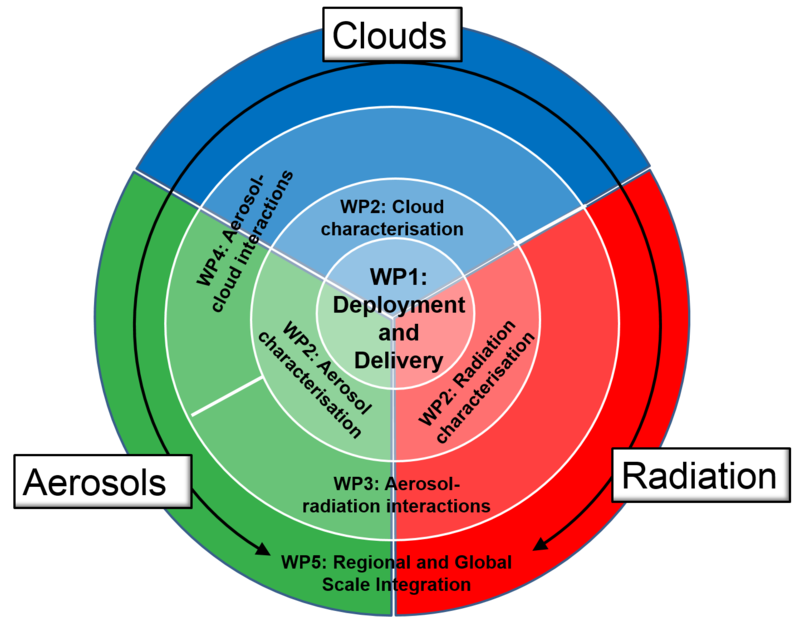 EO6: Characterise key cloud processes and parameters (WP2, WP4). EO7: Use CLARIFY campaign data with representative statistical sampling and high-resolution models to establish relationships between sub-grid scale variables and large-scale model parameters suitable for constraining aerosol-cloud interactions (WP4, 5). EO8: Use synergistic observations/model simulations to investigate impacts on numerical weather prediction and climate model performance, feedback mechanisms, regional and global climate impacts and teleconnections (WP2, WP3, WP4, WP5). The key and enabling objectives are addressed by five inter-related work packages (WPs), each of which has a principal investigator who is responsible for delivering the associated work. Figure 1 shows the relationships between the WPs, while each WP is summarised briefly below. A thorough description of the WPs can be found in the CLARIFY Proposal document. Central to delivering the main scientific aims of CLARIFY is the delivery of a high quality and robust dataset of aerosols, clouds and radiation from across the SE Atlantic region, supported by satellite and surface observations and a range of bespoke forecast products. The work package involves pre-campaign planning (i.e. delivering a secure operating airport, instrument installation and testing, agreement of flight plans, securing accommodation and transport) and providing field campaign support (including use of this website to host forecasting products and links to external forecasting products) for optimal positioning of the aircraft. Moreover, this work package will ensure storage of the campaign data on a quality assured database. Figure 1: The relationship between the CLARIFY work packages. Characterisation of aerosol, cloud and radiation, focussing on key properties (e.g. aerosol chemical and optical properties, size distributions, CCN activity, cloud liquid water path, cloud effective radius, aerosol and cloud spatial and vertical distributions, cloud reflectance, and cloud susceptibility). Deliverables include publishing the mean (and variability of) BBA microphysical, chemical and optical properties, and further publications on CCN budgets, CCN-CDNC closure and impacts of cloud-scale dynamics on CDNC. Using measurements from the airborne instrumentation in combination with radiative transfer models to assess the aerosol-radiation interaction (direct and semi-direct effects) in cloud-free and cloudy skies. The observations will be used to assess the fidelity of modelled direct effects, satellite retrievals of aerosols and biases in cloud retrievals. The aerosol semi-direct effect will be investigated using observations of BBA, cloud and atmospheric structure to drive models with a range of spatial resolutions and complexities. Deliverables include publications on: (1) radiative closure in clear skies; (2) the magnitude of the direct effect of BBA overlying cloud; (3) the impact of overlying BBA on aircraft and satellite retrievals of cloud; (4) the impact of the BBA semi-direct on climate model simulations. Assess aerosol-cloud interactions by combining the in situ and remote sensing measurements with a hierarchy of aerosol-cloud models, from detailed process to global climate models. The observations will be used to evaluate the representation of aerosol and cloud processes in the models and to constrain uncertain model processes, such as vertical velocity variability in large-scale models. Deliverables include publications on the impact of BBA on CCN budgets over the SE Atlantic, the closure between aerosol, CCN and droplet number, impact of small-scale dynamics on simulated droplet numbers in high and low resolution models, and on the limitations of low-resolution climate models in simulating aerosol-cloud interactions. Use the Met Office NWP and climate models to assess the impacts of BBA, aerosol-radiation-interaction and aerosol-cloud-interaction on local, regional and global scales for both weather and climate simulations. Deliverables include publications on assessing the performance of the regional and global NWP model, assessing the impact of parametric uncertainties on aerosol-radiation-cloud interactions, and informing AeroCom database with model simulations of direct, semi-direct and indirect effect.